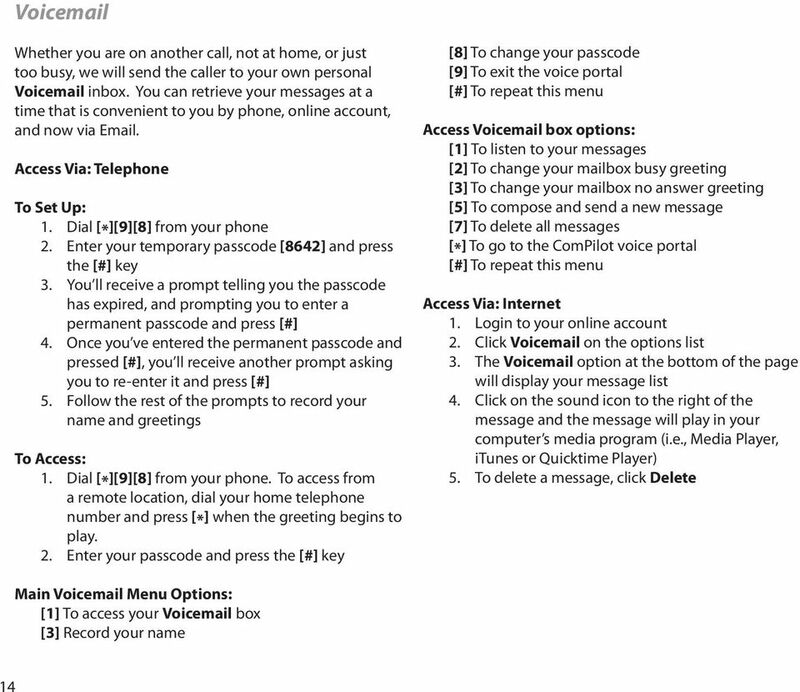 Download "Address Book. Store all of your contacts in your online Address Book." 2 4 Address Book Store all of your contacts in your online Address Book. 2. 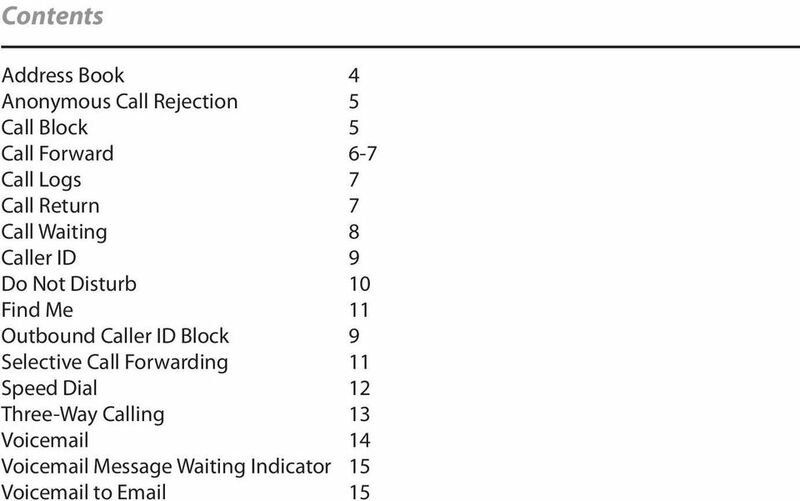 Click Address Book on the Features list 3. 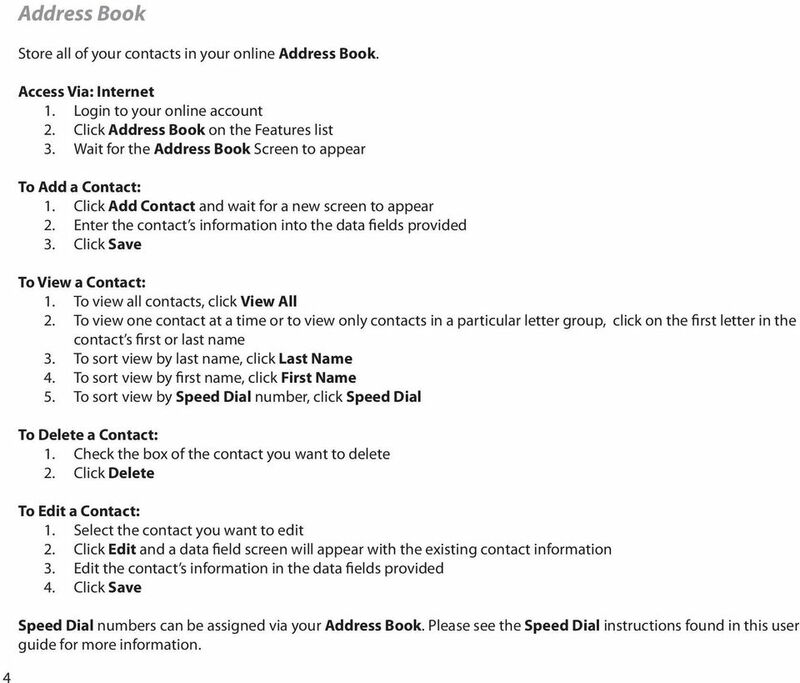 Wait for the Address Book Screen to appear To Add a Contact: 1. Click Add Contact and wait for a new screen to appear 2. Enter the contact s information into the data fields provided 3. Click Save To View a Contact: 1. To view all contacts, click View All 2. To view one contact at a time or to view only contacts in a particular letter group, click on the first letter in the contact s first or last name 3. To sort view by last name, click Last Name 4. To sort view by first name, click First Name 5. To sort view by Speed Dial number, click Speed Dial To Delete a Contact: 1. 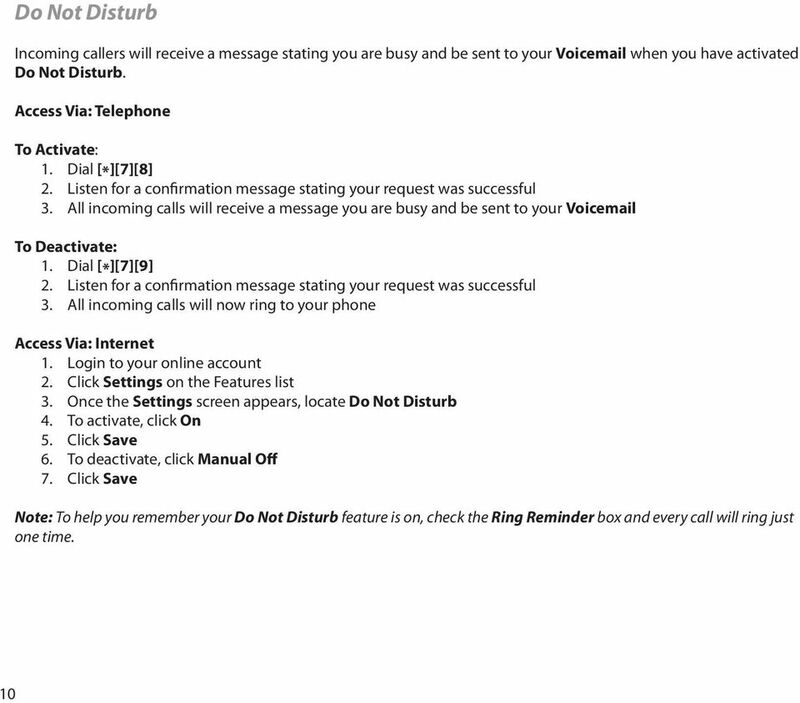 Check the box of the contact you want to delete 2. Click Delete To Edit a Contact: 1. Select the contact you want to edit 2. Click Edit and a data field screen will appear with the existing contact information 3. Edit the contact s information in the data fields provided 4. 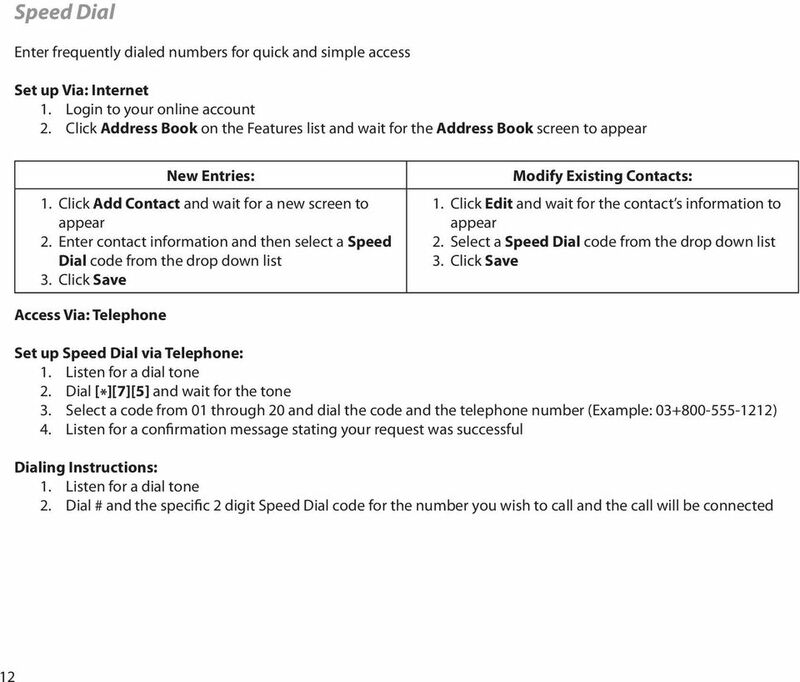 Click Save Speed Dial numbers can be assigned via your Address Book. 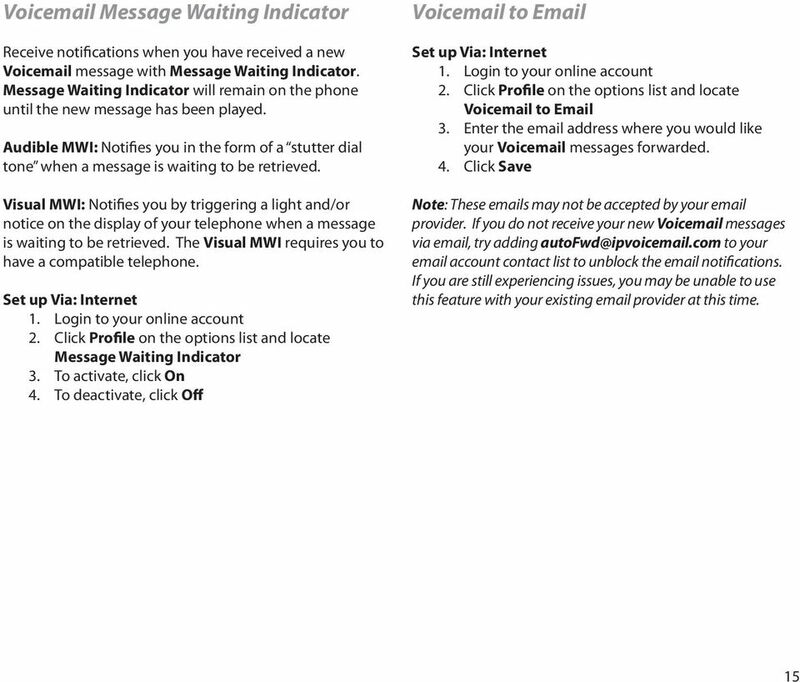 Please see the Speed Dial instructions found in this user guide for more information. 6 8 Call Waiting Missed calls from important people are a thing of the past when you have Call Waiting. To Answer Via Telephone: 1. A tone will sound alerting you that you have another call coming in 2. While on the call, press the flash button once. 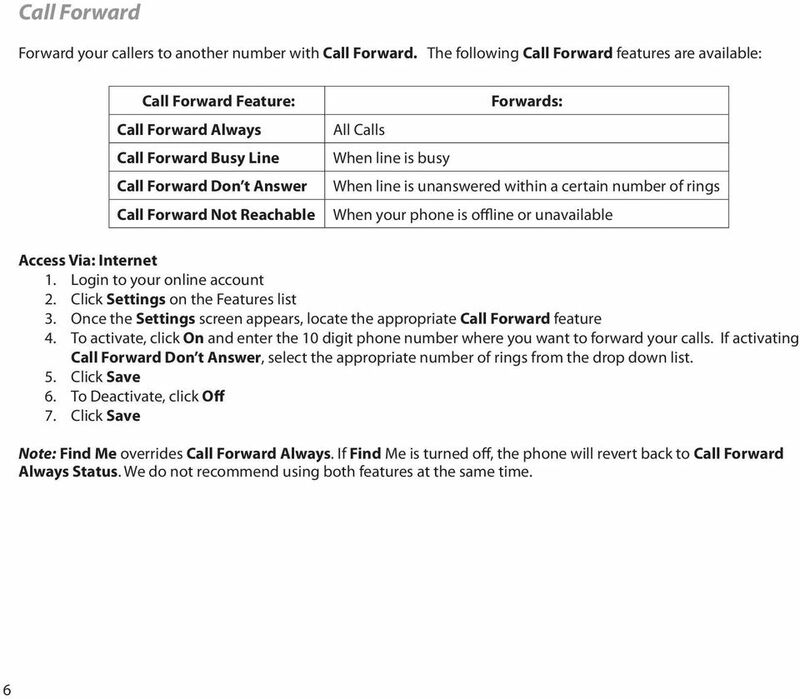 The first call will be placed on hold and you will be connected to the second call. 3. To return to the original call, press the flash button again one time only. 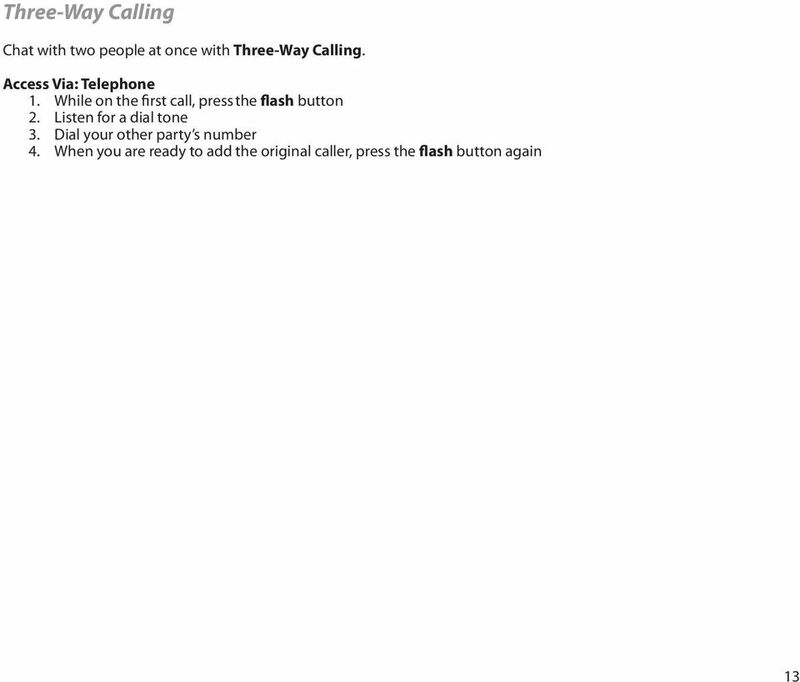 You will be able to switch back and forth between two calls by pressing the flash button. To Activate Permanent: 1. Dial [*] 2. Listen for a confirmation message stating your request was successful To Deactivate Permanent: 1. Dial [*] 2. 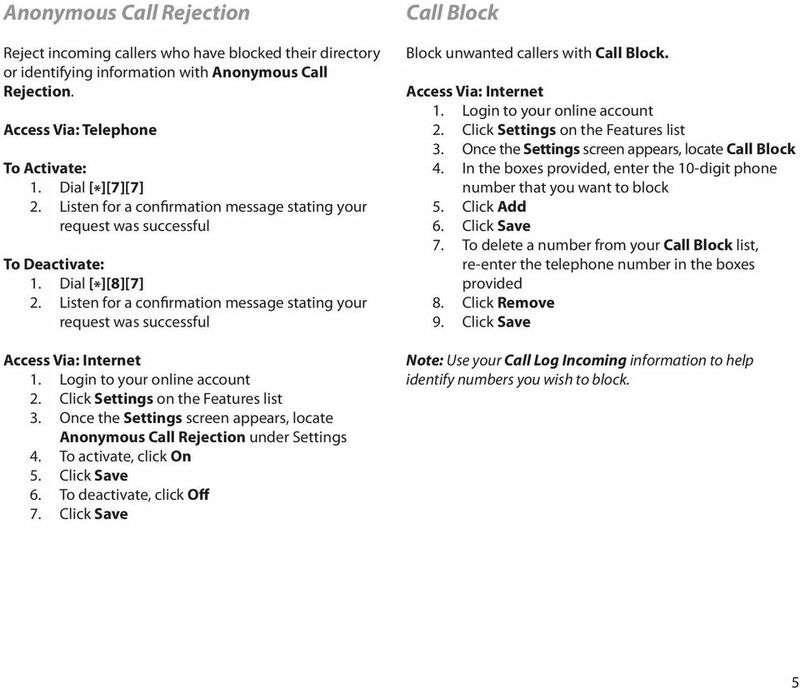 Listen for a confirmation message stating your request was successful To Deactivate Per Call: 1. Dial [*] and wait for the tone 2. Enter the 10 digit telephone number. The area code must be dialed even if the call is local. 3. 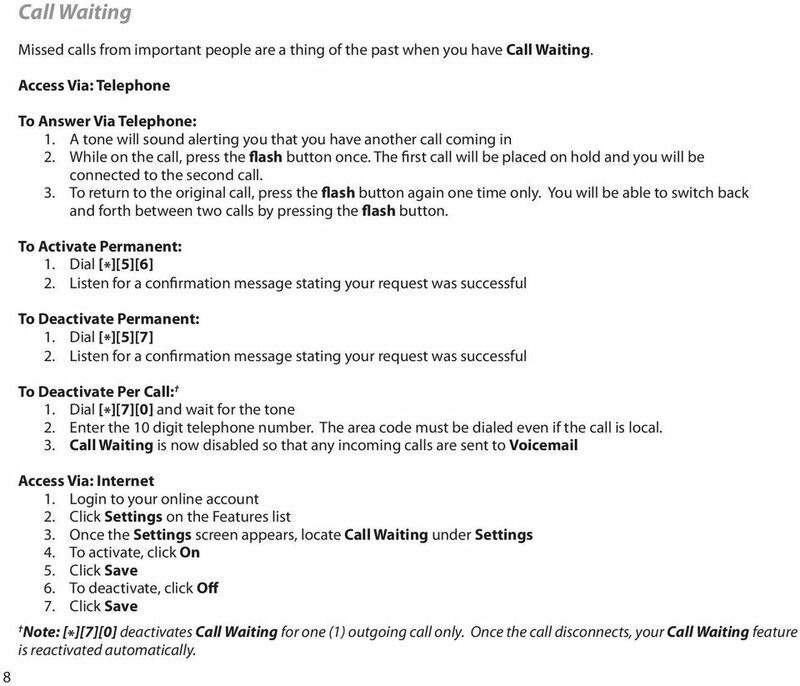 Call Waiting is now disabled so that any incoming calls are sent to Voic 3. 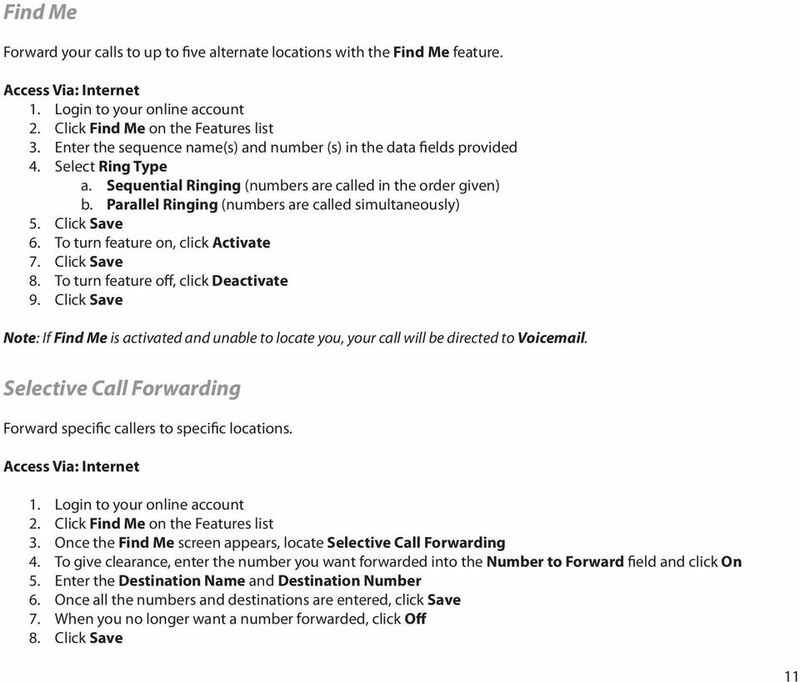 Once the Settings screen appears, locate Call Waiting under Settings 4. To activate, click On 6. 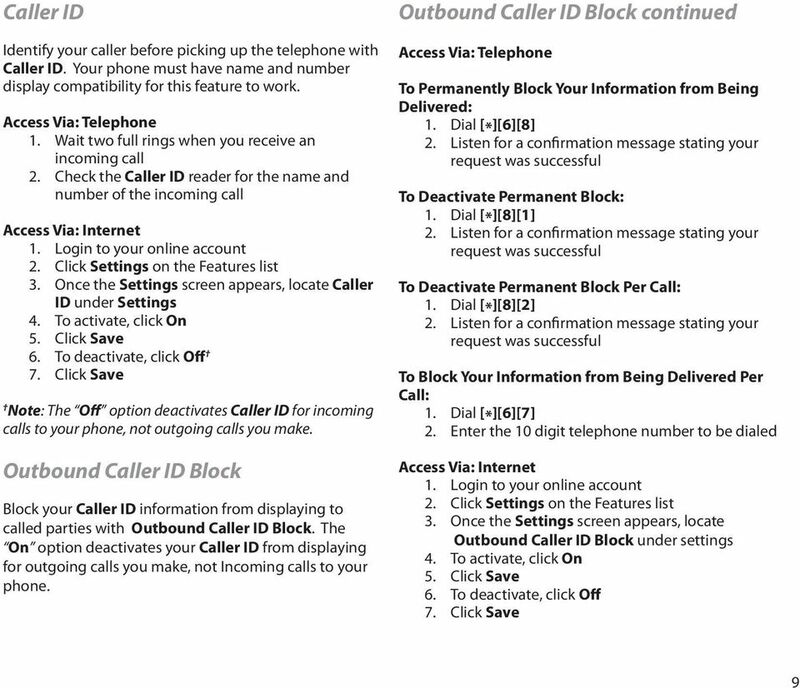 To deactivate, click Off Note: [ * ] deactivates Call Waiting for one (1) outgoing call only. 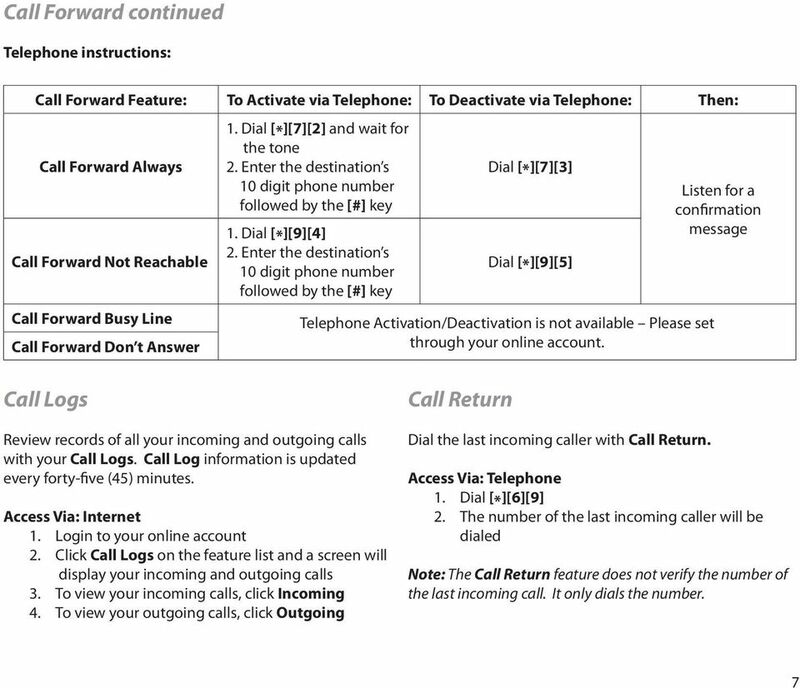 Once the call disconnects, your Call Waiting feature is reactivated automatically.